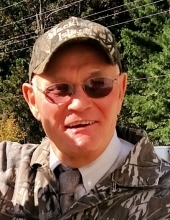 Darrell Ray Ford, 66, of Casnovia, passed away on March 17, 2019 at home. He was born on July 4, 1952 to Harold and Edna (Cousineau) Ford in Grant, Michigan. He graduated from Kent City High School in 1970. Darrell was a self employed dairy farmer. On March 27, 2010 he married Brenda Russell in Kent City. He was a life member of the National Riffle Association. Darrell is survived by his wife Brenda, four daughters: Cari (Joe) Moulden of Casnovia, Kimberly (Bruce) Macy of Casnovia, Stacey (Gary) Brock of Ravenna, Jamie (Kyle) Portell of Grant; his son Cory (Elizabeth) Ford of Casnovia; step-son Matt (Tansy) Cattanach of San Antonio, Texas; step-daughter Lyndi (John) Keizer of Wyoming, Michigan; seven grandsons: Craig Moulden, Austin Ford, Adam Macy, Zachary Macy, Dylan Macy, Keegan Portell, Jack Portell; three granddaughters: Blair Moulden, Gabrealle Ford, Briar Portell; step-granddaughter Ashlyn; his brother Keith Ford of Bailey; two sisters: Adeline Osmer of Sparta, Darlene Wagner of Ravenna; sister-in-law Judy Ford of Kent City. He was preceded in death by his parents, his sisters: Minnie Pant, Nancy C. Bennitt; and brother Dale Kirk Ford. Visitation will be held Friday, March 22, 2019, 5:00 pm - 8:00 pm at Fields-McKinley Funeral and Cremation Services, Grant, Michigan. Funeral services will be held on Saturday, March 23, 2019, 11:00 am at the Algoma Christian School with Pastor John Romanosky officiating. Burial will take place in the Hilton Cemetery. Memorials are suggested to the Sullivan Community Church, 3951 Barnes Rd.Ravenna, Michigan or to the Algoma Christian School. Please share your memories of Darrell online at www.fieldsmckinley.com. To send flowers or a remembrance gift to the family of Darrell Ray Ford, please visit our Tribute Store. "Email Address" would like to share the life celebration of Darrell Ray Ford. Click on the "link" to go to share a favorite memory or leave a condolence message for the family.